Business Folder Icons - 74 folder icons you can use to categorize and organize office documents. 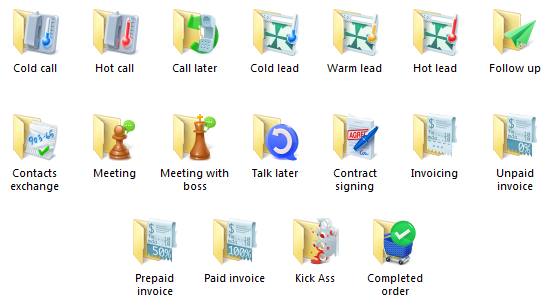 Arrange your work files with Business Folder Icons. 74 folder icons you can use to categorize and organize office documents. Let's be honest: an office computer is a big dump of all sorts of work-related files. It’s a mess of monotonous yellow folders in which it is sometimes difficult to find the right document. Business Folder Icons allow you to mark those ordinary yellow folders with business-themed symbols. Such symbols make it is easy to find the necessary folder with just a glance and to understand what’s inside without having to look closely at the tiny letters of its name. It will contribute to the order and organization of your office computer. Business Folder Icons is a pack of 74 folder icons with business symbols, each created with the express purpose of making it easier to navigate through office documents. easily navigate through the system. You will benefit from this pack if you’re a company executive, entrepreneur, business owner, manager at any rank and level, or if you just want to keep your work folders in order. You will be especially interested if your activities are related to sales, marketing, supply of services, report writing or communication with customers. These are just some of the ways you can organize your work files. There are 74 icons in the set. Don’t limit your imagination, try and find the use that’s right for you. Unlike icons you can find on the Internet, these ones are easily distinguished from each other, no matter what their size or location on your computer. These icons have been specifically designed by the professional design studio IconDesignLAB.com. That’s why they are visible and distinguishable, even at the smallest sizes. These icons were created to take into account the workflow of any business. This means you won’t need to pick images and try to find them yourself. All the icons necessary for your workplace are already there. With their help, you can create a single system for organizing documents in the office, and your employees will no longer be confused by the file system. You can mark dozens of folders in just 2 minutes. You won’t have to upload each image separately. Everything can be done easily and quickly with a special assistant program called Folder Marker. You can use the Business Folder Icons alone, handling the icons exactly as you would do in the standard Windows way, as described in this article. However, it will be more convenient to use them together with the simple and understandable Folder Marker Pro program. It allows you to change the colors and icons of any folder on your computer in just 2 simple clicks. 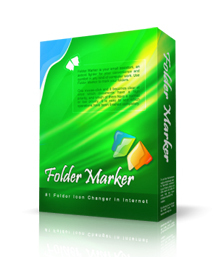 Folder Marker Pro is the most advanced version of the product. It has many additional features, including a license to use it not only at home, but also in the office. Besides that, Folder Marker Pro contains 62 additional icons for office work, which are not included in the Home version. The Pro version allows you to make a backup copy of the marked folders, transfer them to another computer, burn them to a CD, and much more. You can find the full list of differences here. Mark your work folders in just a few short minutes.